Passages to the Past has an extra copy of To Be Queen: A Novel of the Early Life of Eleanor of Aquitaine by the loverly Christy English and I'd like to pass on the love to one of you fabulous readers! Duchess at fifteen, Eleanor of Aquitaine marries the King of France. But will she find that she must pay too high a price to be queen? Although Louis VII is enamored of his bride, the newly crowned king is easily manipulated by forces in the Church. Trapped in a loveless marriage, Eleanor fights for her freedom and for the love of her life. In the arms of Henry of Normandy, Eleanor may finally find the passion she longs for, and the means to fulfill her legacy as Queen. - Giveaway is open to US only. - For +5 additional entries become a follower of Passages to the Past. If you are already a follower you will automatically receive the bonus entries. - For +3 additional entries join the Passages to the Past FB Page. - For +1 additional entry each, please help spread the word by blogging, posting on sidebar, tweeting or posting this giveaway on Facebook. You can use the SHARE buttons below. - Giveaway ends on September 9th. Would love to win this! I'm still considering your services but more later--we have some time before January--I'm going to sign as anonymous because I can't figure out the rest...but this is Anne Barnhill! Good Tuesday morning everyone! I would love a signed copy of To Be Queen! Eleanor of Aquaitaine is such an important historical figure. I'd love to read more about her. Thanks for the giveaway. That is alot to go through for a 15 year old. I would love to read the book. We read so much about English history and it's nice to read about French history. I lived in Paris for a number of years and tried to absorb as much history as I could but did not get to learn much about Eleanor of Aquataine. Would so love to win and read this book to learn even more about my "second home country" and especially its historical figures. As a Facebook Friend to both Amy and Christy and also a follower of PTTP, I have read a lot of comments about To Be Queen. This is a book that I definitely want to read and I would love to win a copy. This book has been on my to-read list for awhile now! I haven't had the chance to get this one yet, but it is at the top of my list! I love the cover and having only read about Eleanor's later life with Henry I am excited to learn about young Eleanor. Thanks for the giveaway! +5 GFC follower (Colleen Turner). +3. Joined Facebook page (Colleen Turner). +1 (or +2). Shared on Facebook and GoogleBuzz. I adore anything about Eleanor, of course! I have been wanting this book for so long. I am fascinated by Eleanor of Acquitane and still haven't read a book about her. It makes great sense to start with the beginning of her life. Please enter me in this giveaway. This book has been on my wish list and I would love to win it! Sounds great! Onto the wish list it goes just in case I'm not lucky. Oh, I've not read this and would so love to! Good morning! I sent a FB request, and am a Google follower. I haven't read anything about her yet, so I'd love to read this! Thank you for the contest! 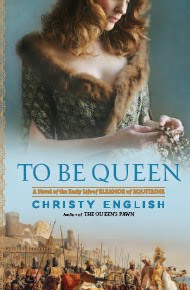 I already won a copy of Christy English's To Be Queen on your blog, so don't enter me, but I just wanted to say that I really enjoyed it and found it to be a real page-turner. Ooohhh please sign me up! Thanks! I am a blog folower and a FB follower! Hi Amy! I would love to win a copy of this book!! I've been wanting to read it for a long time. I am a member of the facebook page. I have been trying to win this book on goodreads for months! I am a follower also! I'm a follower, and I joined on Facebook! I joined on Facebook! I hope to win a copy!! She is a fabulous writer! I'd love to win a copy of To Be Queen. I love all history pre 1603. I've been seeing this book around everywhere lately. I'm shoshanahinla(at)gmail(dot)com and I'm a follower. Would love to win a copy, I`ve read a lil of Eleanor & this sounds very interesting. The book sounds great! Thanks for the giveaway. I have been wanting to read this forever. Would love to give this book a try. I think Eleanor of Aquitaine is such a fascinating character - I'd love to win this! I would LOVE to read this fabulous book. I joined the Passages to the Past FB page as Kristin O'Donnell Cruz for +3 additional entries. Ooo I've been hearing a lot about this book. I follow her on Facebook too. She seems like an awesome author. I would enjoy reading this. Thanks. I would love to win this book! Looks great! Sounds very interesting, and I really like the cover. Love to read it. Please enter me. Thanks!